ST. CLOUD, Minn. (CNS) — One day after a knife-wielding man injured nine people at a shopping mall near St. Cloud, Bishop Donald J. Kettler called for prayers for those impacted by the violence. “Please join me in praying for the victims of last night’s mall attack, for our first responders & for peace and unity in our community,” the St. Cloud bishop said via his Twitter account Sept. 18. Benedictine Sister Michaela Hedican, prioress of St. Benedict’s Monastery in St. Joseph, who attended the news conference, said she felt “profound sadness” when she learned about the Sept. 17 attack at the mall. “The sisters have been praying and will continue to pray at St. Benedict’s Monastery. We have great hope that somehow we can walk over this bridge together,” said Sister Michaela, a member of the Greater St. Cloud Area Faith Leaders Group, which was formed in 2015 to promote interfaith dialogue and build relationships. Bishop Kettler also is a member. Local Catholics can help by also turning to prayer “for the wisdom to know what best to say and do and how to offer support,” Sister Michaela said. 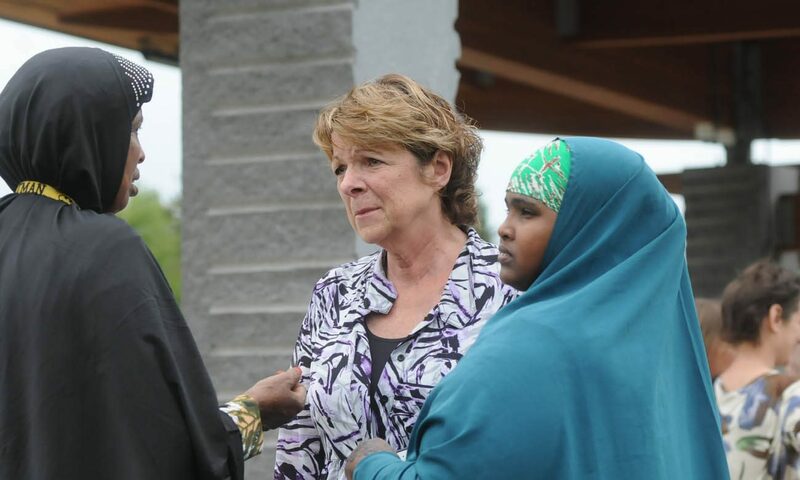 “And then to reach out, not only to the Somali community, but to support each other and (support) the beliefs we have, including the Gospel mandate of loving our neighbor, no matter who our neighbor is. “We also need to recognize that none of us want to be judged as to who we are by the action of one person,” she said. “How we come out of this will define who we are as a community,” added Haji Yusuf, community director for UniteCloud, a grass-roots community-building organization. When Langer heard about the mall attack, “my heart broke,” she said.